The newly re-routed Spruce Mountain Trail, located roughly 20 minutes north of Saratoga Springs in the Town of Corinth, is a 2.5-mile hike leading to the mountain's summit and historic fire tower. The new Spruce Mountain Trail is the result of a successful partnership between the New York State Department of Environmental Conservation (DEC), Saratoga County, and Saratoga PLAN. NOTE: In accordance with the conservation easement agreement for the lands the trail crosses, the trail will is closed to public use during the big game hunting season (October 21-December 3, 2017). The trail can be considered a moderate to difficult hike and leads hikers primarily through both old growth and recovering forests. Spruce Mountain is one of twenty-five mountains in the the Adirondack State Park that have fire towers atop them. The 73-foot fire tower restoration project was completed in September 2015 and is now open. 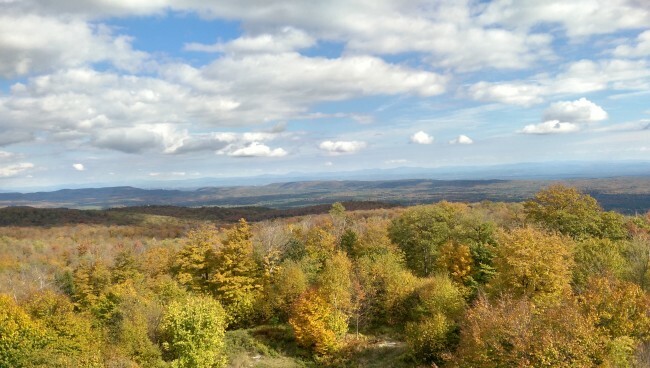 The top of the tower offers amazing panoramic views of the southern Adirondacks, Hudson River, across and the Vermont border into the Green Mountains, and of southern Saratoga County. This trail is open to the public for nature study, walking, snowshoeing, and cross-country skiing. Please carry out all your trash and leave only footprints. NOTE: The trail is closed to public use during the big game hunting season. From Saratoga Springs, NY, head north on Route 9N towards Corinth. Shortly after passing through South Corinth take a left on Wells Road. After a few miles, Wells Road comes to a T-intersection. A right at this intersection puts you on Spruce Mountain Road (not signed) just a few hundred yards down this road there will be a dead end sign. Pass the gate entrance to the fire tower access road on the left and proceed to the parking area.